For thousands of years, churches were the exclusive domain of stained glass windows. There were a few chosen buildings that were decorated with stained glass as well. Traditionally, these colorful window panels are flat. Today, however, stained glass artists have taken it a few steps further, turning it into three-dimensional sculptures and structures. Stained glass works use glass that were colored with metallic salts during its production. These colored glass is cut into small pieces and fitted into the picture or pattern. The pieces of colored glass were traditionally held together by strips of lead, with the whole piece supported by a stiff frame. Details are painted and yellow stain is often used so that the design will be enhanced. Whether it is an art or a craft, the creation of stained glass requires great artistic and engineering skills. The artist conceives a workable and appropriate design. The engineer in him must create a window that should snugly fit into the space where the stained glass is intended to be placed. It must be strong enough to support its weight and resist weather changes. This crafting skills are very much in evidence in the large windows of buildings and churches from the Middle Ages, which manage to survive to this day. Stained glass windows were used before to control the penetration of light, thus they are termed as illuminated wall decorations in Western Europe. In the old days, the design of stained glass windows may be exclusively figurative or mixed with abstract. Most of the common designs were drawn from the stories in the Bible, passages in literature and historical events. Some of them were created to represent revered patrons or saints, and others used symbolic motifs. Then and now, sometimes the subject of stained glass art is thematic. If used in the home, designs tend to focus on landscapes, flora and fauna. When used in centers of learning, it could be figures that represent the sciences and the arts. In churches, themes usually revolve around the life of Jesus Christ. While still popularly used in and identified with churches, there are modern buildings and homes that incorporate stained glass windows and panels to complement their exterior and interior design. The most famous however are those that are found in several old cathedrals in Western Europe, most of which date back to the Middle Ages. Inside the Canterbury Cathedral in southeastern England are stained glass windows that were created in the 12th and early part of the 13th century. Several of the scenes depicted stories from the Bible while others were pastoral scenes. 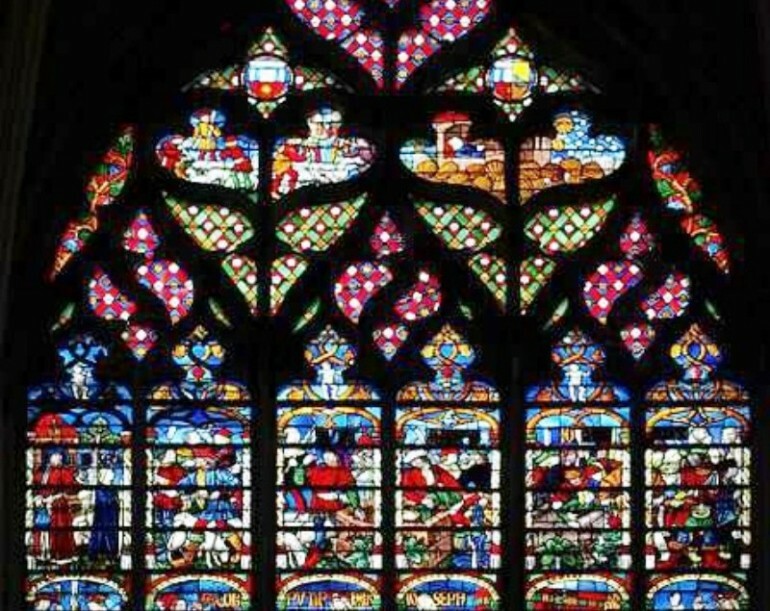 Madonna and Child and the Last Supper are just two of the Biblical scenes depicted in the stained glass windows of the Chartres Cathedral outside Paris. Distinguished by the blue-colored glass used in the panels, these 13th century creations are believed to be one of the most complete collections from the medieval period. There are 152 pieces that had withstood the test of time. The lives of several saints from the Old and New Testament are shown in the 44 stained glass windows that adorn the Basilica di Santa Maria del Fiore (Florence Cathedral) in Italy. These were made between the 14th and 15th centuries. On the other hand, scenes from the Book of Kings and the Book of Esther are the themes for the stained glass windows at the La Sainte-Chapelle Cathedral in Paris. In the modern world, some of the most amazing stained glass art are those found around the globe. At the Grossmünster Cathedral in Switzerland, the abstract stained glass panels incorporate thin slices of agate. These are the works of artist Sigmar Polke. You will be amazed at the façade of the Netherlands Institute for Sound and Vision, which is entirely covered in stained glass from Jaap Drupsteen. Each panel contains an image from Dutch TV, which can only be viewed correctly at a certain angle. Czech Art Nouveau painter Alfons Mucha created the new stained glass windows of the St. Vitus Cathedral in Prague. The interest in stained glass never seemed to wane. In fact, the knowledge artists gained from studying ancient stained glass windows have spurred them to experiment and invent. Today some stained glass art are displayed in museums and art galleries. 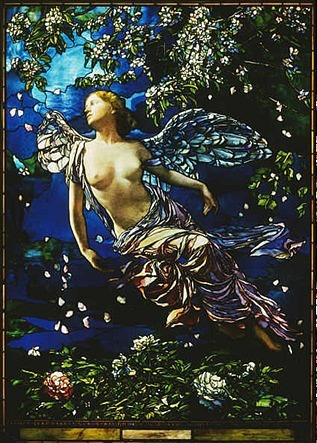 In the United States, there were several decorative arts studies that produced beautiful stained glass, such as Louis Comfort Tiffany and John La Farge. Many of the top stained glass artists hail from Britain and Europe. Mid-19th century artists from Britain are Edward Burne-Jones and William Morris. Some 20th century artists that experimented with stained glass include Marc Chagall, Piet Mondrian and Theo van Doesburg. Several important stained glass artists have emerged in the 20th century whose works are not limited to creating rose windows for churches, but are now incorporating the art of stained glass in modern architectural showpieces, art installations and sculpture.